takes a year to establish." GTBFYB: "Take out an end frame, look for the queen then lay it (the frame not the queen) flat on the side of the hive furthest from you." ME: Personally I'd've written "against the side" rather than "flat on the side." Picky? Yes, I am, but it makes a difference. And what if the hive furthest from me is across the yard? GTBFYB: "If a frame becomes jammed, …then leverage with the hive tool may well pull the frame apart. It is better to hammer the nails horizontally through the side bars…"
ME: What? Oh, you're talking about how the frame should've been assembled in the way-back time, not suggesting to hammer the nails during an inspection (the topic of the paragraph). 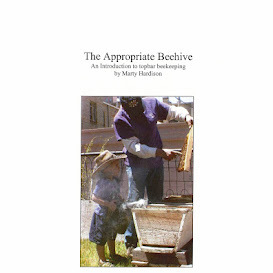 Probably a result of being co-authored, the book might as well have been titled Ramblings of a Couple of Beekeepers. Many paragraphs are completely unrelated to the one previous or subsequent and, without a proper train of thought, I find myself unable to focus on what the authors are saying. I'm thrown off by things like a sudden change in subject from hive inspection to feeding. A paragraph leads off by saying one of the authors is fervently against feeding established colonies, but is quickly followed by several suggestions on what and how to feed. The use of "however" or "although" doesn't seem part of these authors' style, and it's confusing. I embarrassed to admit that I was tricked into buying this book by its title. 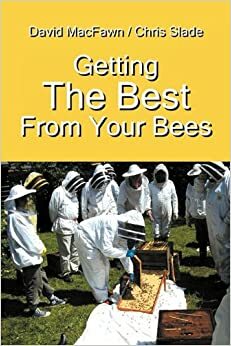 A good editor would never have allowed a book so-titled to have a section on Colony Management that is barely more than a page. The section on Beekeeping Equipment is even smaller. It's really 4 pictures of cork hives in Spain with captions. Really? Really. I've never returned anything to Amazon before, but I wouldn't even stick the poor library with this one. It's goin' back ASAP. You can rest assured that if I ever self-publish a book, it'll be well-edited. I happen to know a great editor who's also a beekeeper… I'm married to him!